We are a house obsessed with all things egg. We like to eat them fried, scrambled, boiled or deviled. We use them for baking, for breakfast and sometimes for lunch and dinner. Yes, we are a house full of egg enthusiasts and, just when we thought we couldn’t find another way to enjoy the egg, DIY Sci came to Prime. DIY Sci is a Fox series hosted by Steve Spangler and a recent Amazon Prime discovery for my boys. The show is fast paced and silly with fun experiments and scientific explanations. Everything Spangler does can be done at home with (mostly) common household items. Like vinegar…and plastic bottles…and eggs. 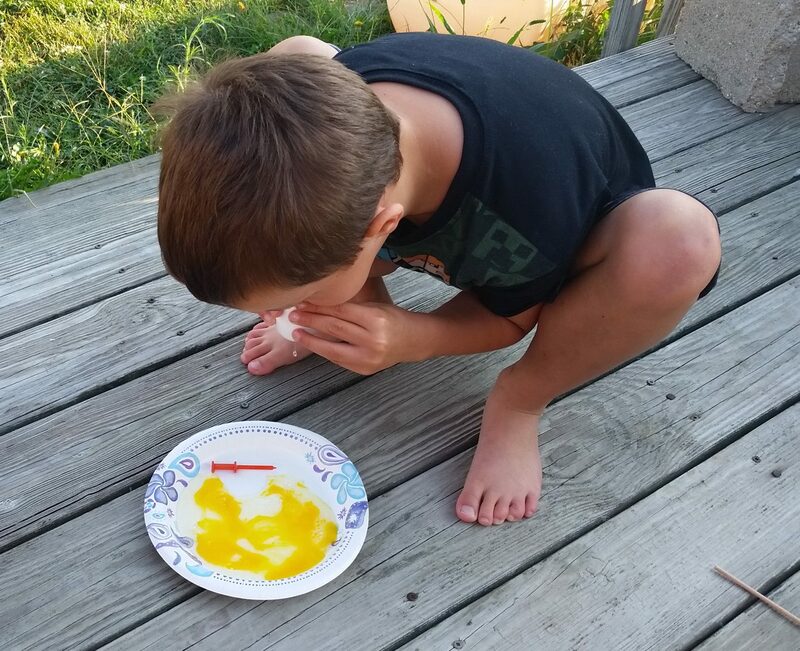 First, the boys used an empty bottle, paper plate and cracked egg to demonstrate how to use to suction to separate the yolk from the white without breaking it. I was totally impressed with this. I always make a mess or break the yolk when I try separating eggs…even when I use those little egg separator tools. Who knew that all I needed was an empty water bottle? Then, Joe wanted to show me how to squeeze and egg so it wouldn’t crack. He held it in his hand longways and squeezed. It didn’t break! Then I tried it, but didn’t hold it longways like he did…what a mess that was. The latest experiment was an oldie but a goodie. The ol’ blow-the-egg-out-of-its-shell-through-a-pinhole trick. The shell was still intact after this one so Joe wanted to use it for one more eggsperiment: The Rubber Egg. He put the empty egg in a glass, covered it with vinegar and weighed it down so it would stay completely submerged. After a few days, he checked on it and sure enough, some of the outer shell had dissolved. 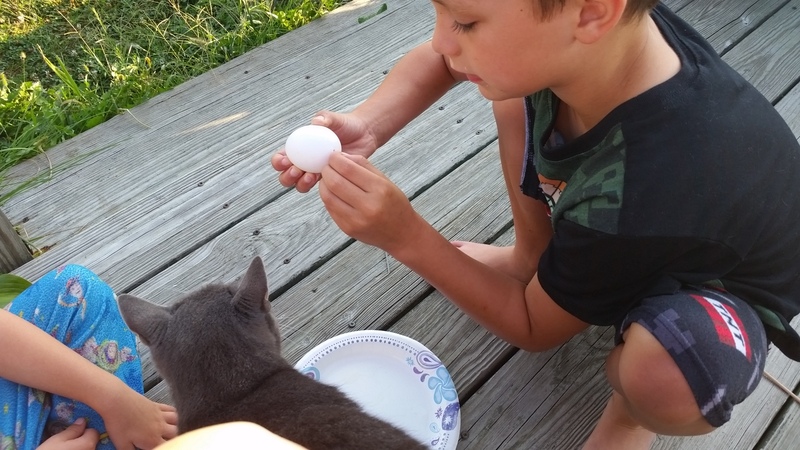 DIY Sci has inspired may experiments around the house, but so far the eggs have been the most fun. It is probably not a coincidence that they are also the messiest. This entry was posted in Chickens!, Education, For the Kids, Homeschool, Life. Bookmark the permalink.